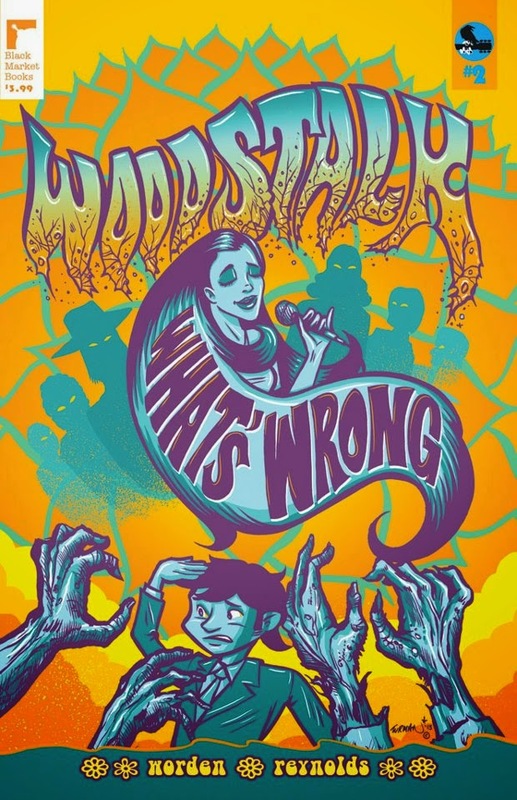 Woodstalk is a comic series I picked up at the Genghis Con. It’s a great idea and one of those comics I wish I had thought of! As the title implies, it tells the forgotten story of the zombie outbreak at the most famous music festival ever, Woodstock. Writer and pencil artist Bruce Worden intends to cover the entire festival, having each issue cover the time during the performance of each act at Woodstock. But the real stars aren’t the actual performers that played those days, but rather…the Zombies! No, I don’t mean zombies. I mean The Zombies, the British rock group that in reality split up right before Woodstock began. If you don’t know who the Zombies are, you need to go learn some music history. I’ve been a fan since I was in High School and first heard “Time of the Season”. Along with “She’s not There” you have two of the most amazing sounding songs of the era. 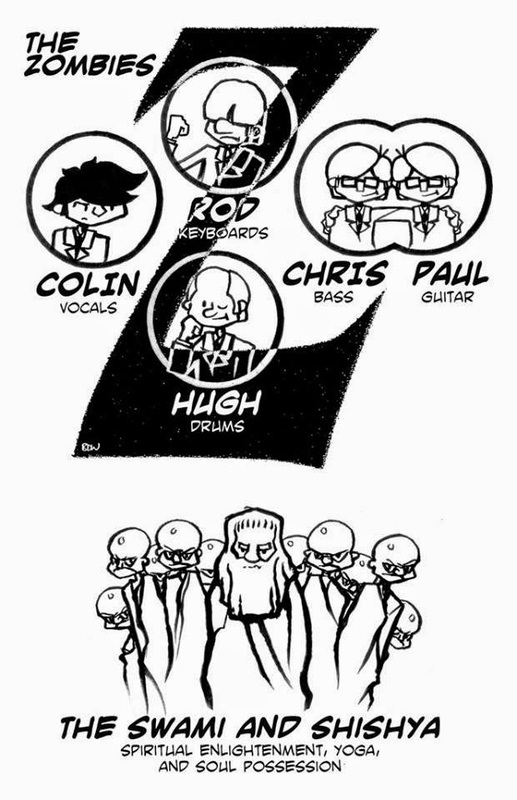 The rest of the Zombies’ catalogue is also quite good. Anyway, back to the comic. The Zombies show up hoping to get some time on stage at Woodstock, even though they aren’t invited, which is funny to begin with. However, they soon find themselves surrounded by young people mindlessly staring off into space. And then they encounter some zombies! (Basically the same thing except flesh-eating.) The zombies have to fend off the zombies, trying to stay alive while trying to get on stage. They have some knowledge in the area of mysticism, which they put to good use against the undead hordes. All while no one else notices. I’ve finished the first 3 issues of Woodstalk, and I await more. The first issues each feature a different inker, but the art is solid in each. And the story is well told, clear and fun! Review: Out With Dad 3.20 "Getting it Out"
It’s about time I got back to writing my reviews of the last episodes of season 3 of Out With Dad. Getting it Out begins with Nathan talking to Johnny, at first about Rose’s predicament at school, but most importantly about the upcoming barbeque and Angela being invited. Nathan is worried about Angela’s presence because of “how he gets” during the event. Johnny ends up volunteering to talk to Angela about Sarah (Nathan’s deceased wife). Back at school, Rose meets with her principal, intent on revealing everything about the bullying she’s been experiencing since she was “outed”. Mr. Gladstone is very understanding, and emphasizes that Rose’s safety is more important than other students’ (or their parents’) religious beliefs, even in a Catholic school. Then comes the twist, when Mr. Gladstone comes out to Rose. He even admits he could lose his job if word got out. This is rather sad, because it indicates that he is not able to be himself and work for the Catholic school. It is all too familiar, as where I live a teacher was recently fired after announcing his wedding plans to another man. Mr. Gladstone’s has a willingness to hide his true self in order to work in his position, but I don’t think I could work for an institution that had such a bigoted policy. The story continues with Claire asking Kenny about a gift for Rose’s birthday, and him explaining not to get one because it’s weird. Rose shows up, confirms the “no gift” rule, and holds Claire’s hand while telling her about the conference with Mr. Gladstone. The next scene has Johnny talking to Angela about how Sarah died. It’s incredibly sad. It does explain the special relationship between Rose and Johnny, which was a very nice touch and not something I had thought about before. So I think it was a great idea to include this scene. Besides, it’s always nice to see more of Angela! And then the episode ends with one of the funniest scenes of the series, as Nathan agrees to come out to his parents as a father of a gay teen. It’s one of the most naturally acted scenes, too! It’s just incredibly cute! Well, this episode seemed to have it all….but the best is yet to come!! On November 30th I attended my first Genghis Con in Lakewood, Ohio. The small press/independent comics show is a one-day event near Cleveland. I was a bit concerned about how turnout would be because even though this is not the first year for the con, it was at a new site. The site, known as the Screw Factory may not look like much on the outside, but the space inside was very nice for the participants and there were plenty of attendees circulating around the artist tables. I had a great time, sold some stuff, and met Tom Orzechowski. Tom is a famous comic book letter artist whose work I have admired for decades! I’d like to thank everyone who stopped by, talked to me, bought or traded stuff with me, or even those who came by and I didn’t have the pleasure of meeting. I plan to be back next year! I don’t have any pictures of the event, so I’ll just post some statues I’ve made recently. 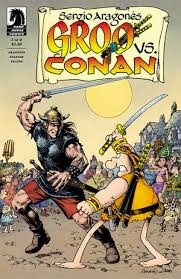 Groo vs. Conan is, simply put, the best comic I’ve read all year! I just have to write a bit about the characters, creators, and how much I enjoyed the series. If you know of them and this series, it will be a lot of stuff you know, but please be patient. I am writing this in the hopes that someone out there who never has before might just give Groo a chance! Sergio Arangones is probably the best funny-style cartoonist ever! He’s been doing doodles and cartoons for Mad magazine for decades and he just seems to fit more in a page that is physically possible. Mark Evanier write Groo and is also known for writing a bunch of Garfield cartoons (My wife is a huge fan and we own them all on DVD). 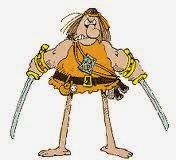 Somehow Mark and Sergio got together and created Groo the Wanderer, the funniest barbarian ever! Groo is also the best. At what he does best, that is. By which I mean kill people and act without intelligence. He also likes cheese dip. I don’t know why I’m mentioning that now except it’s funny. Thomas Yeates is a great artist who draws some very serious Conan comics. This somehow makes him perfect to bring Conan into the world of Groo. Seriously. This guy is very good! 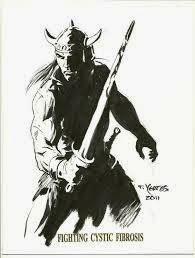 Conan the Barbarian, if you don’t know, is the creation of Robert E. Howard and was first published, in prose not comic form, in the 1930s. 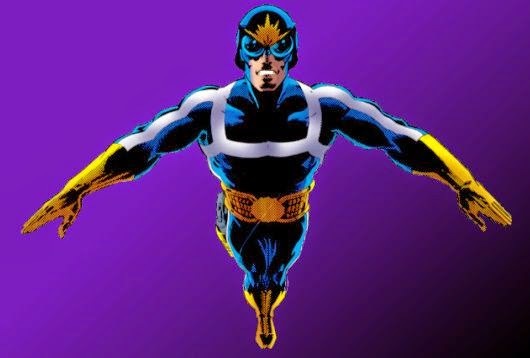 There have been many adaptations including movies and TV series, as well as the current Dark Horse comics and a long run of comics at Marvel. Conan is big and strong and clever, and has defeated many a foe. Not a foe as dumb as Groo though. Of course, no one is as dumb as Groo. So Conan is facing his greatest opponent: A killing machine with no brain. Sounds like fun! Groo vs Conan mixes the grim and gritty world of Conan with the strange and whimsical world of Groo in a fashion that reminds me of the old Disney movies when they would combine (2-D) animation and live action footage. But the story really revolves around events that occur in the real world. Or at least, the real world as depicted by Sergio. The whole crossover results because of Mark and Sergio trying to save a comic-book shop that is going to be leveled to make way for a shopping center. This somehow leads to Sergio being injured, and getting lots of strange medication that make him feverishly imagine that he is Conan and is on a quest that involves Groo. It doesn’t sound funny at all when I type it, but it’s extremely hilarious when you read it! Really!! On the Groo side of the tale, the wanderer is hired to destroy a bakery loved by the locals to make way for a castle. Conan is tasked with stopping the simple-minded one from wreaking havoc. And the local villagers hilariously observe, comment, and get all messed up in the whole thing! Of course, we get to see the inevitable showdown between swordsmen. The battle of the century! The war to end all wars! (Wait, that was WWI…) Anyway, I just can’t describe it without totally spoiling the whole thing. So I suggest you go buy it. I bet you can still order the individual comics, which are cool because they include letters pages. Or I guess there’ll be a collection soon. But I wouldn’t wait if I were you! You need to read this series now before the next Groo series starts. After all, you don’t want to have the next death spoiled before you read it! And with Groo around, there are a lot of deaths!! Review: OWD 3.19 "Vanessa meets Sera"
Now is the time to discuss episode 3.19 of Out With Dad, “Vanessa Meets Sera”. This episode continues the spin-off series Vanessa’s story with a rather different setting as Vanessa discusses her life and current predicament with her brother’s friend Sera. There two non-story related things in this episode that are interesting. 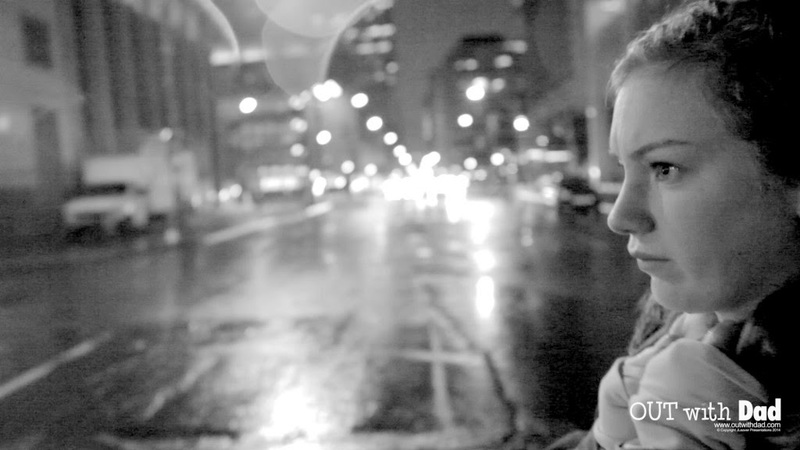 First, this episode is the first cross-over of Out With Dad, as the character of Sera is the star of another Toronto webseries called “LESlieVILLE”. Also, this episode was filmed in an interesting location, a solarium overlooking a Toronto street. This caused some technical difficulties, but the final product looks very nice. As for the story, this episode is almost entirely a conversation between the two characters. Sera has come to give Vanessa some perspective about accepting herself. It is, as Vanessa asks, a conversation about “gay things”, but it is also about labels and belonging to a group. Sera begins with a story about High School, Xena, and labels. When Sera found an online group of lesbian fans of Xena, she found comfort in knowing there were other people like her, and they all fell under the “lesbian” label. This is an interesting perspective, because knowing there are people who are like you provides you with people you can identify with. The problem Vanessa has with this is that she doesn’t really see herself as belonging to a group, or having a label. Vanessa’s attraction to Rose has not become an attraction to girls as opposed to boys. But Vanessa does seem most likely to think of herself as bisexual. Despite her insistence that there’s only been one girl, she was at least somewhat interested in the girl at the flop house. Sera seems to convince Vanessa that loving someone doesn’t have to depend of gender, and that Vanessa’s parents really do care about her, they just can’t accept her being anything but heterosexual. I think we’re seeing Vanessa finally get some of the support she needs to deal with things in her life. 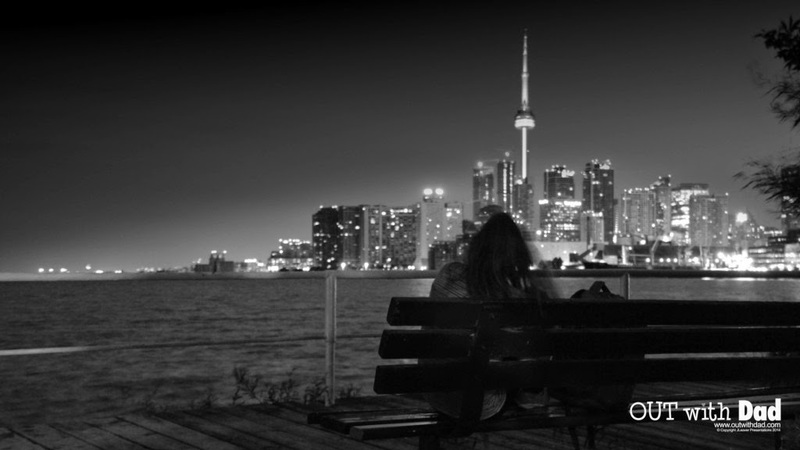 There are far too many situations that end tragically because people are kept from the support they need. And having someone, especially a close friend, can help you get through almost anything. And now we pick up where we left off reviewing the final block of episodes of the award-winning and totally terrific webseries, Out With Dad! My last review covered Out with PFLAG, part III, so now it’s time to take a look at episode3.18, Out with PFLAG, part IV. The story picks up with a conversation between Rose, Nathan, Claire’s Mother, and Robin (the PFLAG sharing leader). In this conversation, Rose and her dad finally open up and come clean about everything that’s been happening at school with the changing room, Brittany, and the gym teacher. 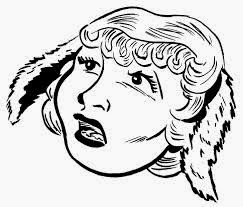 Rose is finally convinced that she cannot keep quiet and she must tell all about the situation to the principal. The most interesting thing about this conversation, to me, is Rose’s statement that she is herself in the wrong. It implies that she still feels guilt about being a christian and being homosexual. The next segment has Claire, Alicia, and Nomee discussing starting a Gay/Straight Alliance at their school. The conversation includes facts about GSAs and how some religious schools do not allow them. Fortunately, Alicia steps up and shows her willingness to begin an organization no matter what, and Claire is thrilled to have Alicia as an ally. The episode ends with an emotional conversation between Rose and Nathan. They talk of what’s been happening at school, and not keeping secrets from each other. It’s great to see Rose realizing that despite her wanting to stay away from the spotlight, she has to stick up for herself. And she has to tell people when something bad, especially something physically harmful, happens to her. The conversation gets a little lighter as they discuss Rose’s upcoming birthday. But it ends on a dark note as Rose realizes Vanessa will be absent at her party this year. Or will she? We’ll check in on Vanessa next time, and maybe get a hint. I thought I'd take a break from writing long reviews this week to show off the other stuff I've been spending a lot of time doing lately. Rocket is ready for action! Close up of his gun. Of course, statues, including custom works, are for sale! E-mail me at fedscomic@yahoo.com for details! Out With Dad, episode 3.17 is called Out With PFLAG part III. If you’re wondering how that title follows the previous episode, you are forgetting that part I and II of PFLAG occurred last season when Rose and Nathan attended their first PFLAG meetings. It was the first episode of OWD I wrote a real review of, which you can read here. This is very long episode, coming in at over 20 minutes including credits. But with so much happening this time, it certainly doesn’t seem long! This episode begins with Rose and Nathan entering and greeting Claire and her Mom. This is a good nod to the first PFLAG episode, where Rose is surprised to see “the girl from the washroom”. But there is a surprise attendee, and it’s Alicia, coming along to learn what she can do to be a “straight ally” to her friends who identify otherwise. I can relate to her feelings, but more on this later. After the girls greet each other, the meat of the story begins as new leader Robin initiates the sharing with the story of his cousin. Said cousin was excommunicated by his family after coming out, even when he was dying of cancer. This story reminds me a little too much of Vanessa’s family. Not only because of their unacceptance of Vanessa’s sexuality, but of the way they abandoned their eldest son when he married outside of his faith. I can’t imagine anything short of a major crime would make me cut off communication with one of my children. Robin also comments on how attending the sharing meetings, listening and sharing, makes him feel better about things. Morgan comes next. I have a small problem with the presentation of Morgan’s story, and it has everything to do with continuity. Morgan implies that he was quiet and looked very bad during the last meeting. By this, he is referring to PFLAG meeting from last season. But that would, in OWD time have been months ago (last school year). Therefore, either this is a stretch by Jason to help us remember Morgan, or PFLAG only meets every few months. Which I guess is possible. It just seems unlikely. Anyway, that’s way too much time to discuss such a trivial matter that doesn’t affect the plot at all. Morgan identifies himself as trans and tells of begin raped and beaten by a bunch of drunk guys. It’s a horrible story, and difficult to listen to. But it’s well written and told. Sam’s tale of literally being in the closet is much lighter than Morgan’s but also rather tragic. Though no physical harm was done to her, having to hide her true self from her girlfriend’s family has left her with some mental problems. What if Vanessa had chosen to sneak around with Rose while hiding the relationship from her family? I don’t think Rose could have handled such an arrangement. I also think this type of relationship is rather common, and I have heard first-person accounts of such. Alicia speaks next, and sound just like I would if I were to go to a PFLAG meeting, I think. Though I try to be an ally of the LGBT community in my words and deeds, I’m sure I would be at a loss for words in a meeting centering on the experiences of people who are not straight. Claire mostly recaps recent events at school as well as expressing how nice it is to share such things with people who will listen and support her. This is the first that Rose hears of being banned from the changing room, however. Rose continues this discussion of the difference between how non-heterosexual students are treated at school-especially Catholic School- compared to the friendly atmosphere of the sharing meeting. Claire’s mom discusses learning about her daughter and how she isn’t allowing her husband to wreck things, even if he isn’t as receptive as she is. This is eerily different from Vanessa’s father going along with his wife, when he seems more open to wanting to be supportive. Nathan discusses the unfairness of how Rose and Claire are treated compared with the other students. This is important. I think it’s important, for instance, to speak not of “gay marriage” but of “marriage equality”. Because that’s what it’s really about, right? Everyone should be treated fairly, no matter what. It sounds like Ontario, Canada is ahead of the USA in making sure people are treated equally, even in a religious institution. Religion has repeatedly been an excuse for bigotry here in the United States, including in my state, which isn’t even close to the south. Heck, I’m just a boat ride from Canadian soil! Anyway, this discussion of the school and changing room will lead us into next episode. By the way, Rose referred to herself as a lesbian! Good for her! The “L” word was one of the most interesting parts in the “lost episode” I got to transform into a comic. Though the whole comic is up on the web, I thought I’d quickly mention I’m starting to post some extra art and pages on the comic fury site. This week I look at episode 3.16 of Out With Dad, my favorite webseries if which I’ve discussed here in depth a lot in previous posts. “Stressing Out” involves mostly Rose’s school. This episode hits me rather hard because I am a teacher in real life, though I work in a public school that is not subject to some of the prejudices as Rose’s school environment. Granted, some of the views in this story do crop up in all schools, but not in the particular area where I work. The episode begins with a conversation between Rose and her dad. He knows something is bothering her and tries to figure out what. Rise attempts to skirt the issues, but reveals a bit too much in the process. The first thing Rose talks about is the dance tickets Claire tried to buy for them. Rose insists things between her and Claire are fine, though the attempt to buy the tickets does bring up a thought to me. Rose and Claire make such a nice couple, in part, because of how the complement each other. Claire is more vocal and out, while Rose is quiet and shy. However, this has caused some friction already, and could signal trouble in the long term. It depends on how much Rose can come out of her shell. Anyway, Nathan wants desperately to help Rose, but she doesn’t want to be the center of attention at school, so she’d rather put up with the discrimination hoping people will eventually forget about it. At school, we find Rose is afraid to enter the changing room before gym, and would rather be late for class than face the homophobia of Brittney. Then Nathan gets THE PHONE CALL. The gym teacher is calling concerning parents not wanting their daughters changing in front of Rose. The teacher’s idiotic solution is for her to use the staff change room. Nathan is understandably incensed. The solution hits me this way: in order to have equal access to the education of heterosexuals, it is necessary to have homosexuals separated. You know, because separate but equal works so well. Nathan demands action, but wants to keep things from Rose. Certainly so as not to upset her and so that she won’t be getting the extra attention she doesn’t want. The final scene includes the wonderful return of Alicia. Okay, she hasn’t really been gone, but she hasn’t done much this season…so far. But I like the interaction between her and Rose. Rose had mentioned in a video diary that she thought Alicia was a bit stuck up and kept Rose from spending time with Kenny. At first, Rose seems rather cold towards Alicia here, but when Alicia asks about Vanessa and offers to put up posters about her, Rose sees to thaw. Then, when Claire arrives and the Fall Formal comes up in conversation, Alicia offers to boycott as a sign of solidarity. Finally, Alicia asks about PFLAG. She really is quite a sweet girl, that Alicia. By the way, Rose tries to get Claire to go to the dance without her, but Claire will have none of it. Kenny is all for skipping the dance also. These people really care about Rose, but I don’t think she’s reacting well. In fact, Alicia, Kenny, Claire, and Nathan all seem to have the right ideas throughout the episode. Rose, however, has not responded to her difficulties well. Ignoring a problem and hoping it will go away, plus refusing the help of others? Not very good, Rose. I know it may be hard to be in the spotlight, but I think you have to do better. Would you want the next girl to come out to be treated like you have been? Finally, the episode ends with Claire giving Alicia her MOST ADORABLE LOOK YET! I love this show! Review: Out With Dad 3.15 "Vanessa's Calm"
I’m going to talk about the final third of the third season of my favorite webseries, Out With Dad. I’ve been viewing and re-viewing the episodes, so I guess it’s time I review them. First, I think I’ll make some general comments about the series. I really do think season 3 is the best Out With Dad yet. I say “yet” because I really hope there will be more. Mostly because I really love these characters, and I just hate sating “goodbye” to them. But also, Out With dad isn’t just about these great characters, but how they deal with issues that beset people who are LGBT and their families and friends. The situations challenge the characters and make the viewers care about them. Season 3.3 begins with episode 3.15, “Vanessa’s Calm”, in which Vanessa and her brother Matthew discuss her problems over a breakfast of dry “crap” cereal. Vanessa explains what has happened between her and Rose, and is shocked at how well her brother handles the news. She speaks of her envy for Rose, because Rose has support from her dad despite being out, while Vanessa gets no support at home despite having 2 parents plus. The most interesting point in the conversation for me is Vanessa talking about Johnny. She states how Johnny being openly gay always made her feel uncomfortable. I guess this shouldn’t surprise me so, knowing the views Vanessa’s parents have and that she’s certainly been taught that since she was small, but seeing Vanessa being such a victim lately, I haven’t thought about her prejudices. Speaking of prejudices, Matthew is introduced to the idea that gay people can be Bi-Phobic, which is one of those things Out With Dad has brought to my attention that I never thought of before. 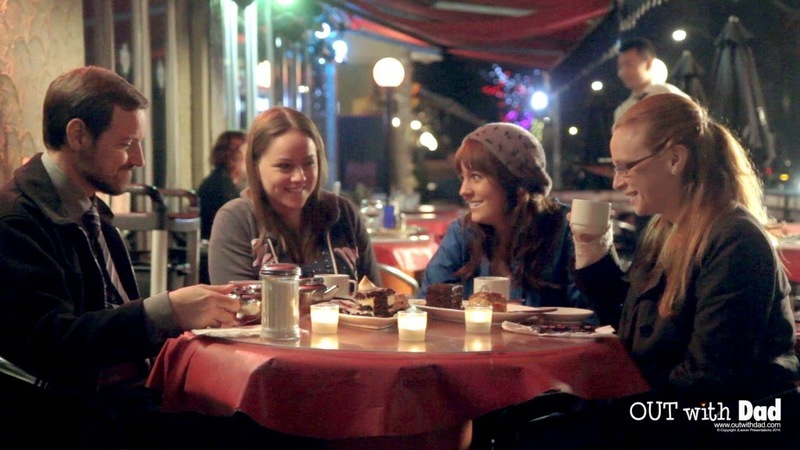 The episode winds down with the setup for Vanessa to meet Sera, a character from another webseries with an LGBT theme. I’ll discuss that episode later, but I’m going to get back to Rose’s story next. Reviews: Gotham and Agents of S.H.I.E.L.D. The new television season has begun, and comic-book geeks like me have two shows we are currently watching…and discussing. I speak of the second season of Agents of S.H.I.E.L.D. and the beginning of Gotham. Both shows have lot in common. 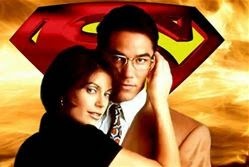 Mostly, they are both about super-hero universes but do not star any super-heroes. The main characters are just regular folks. Be they super-spies or incorruptible cops, the good guys are always going to be challenged by the villains, especially if the villains have super powers! Also, both of these series spun off of popular movie series, though Gotham has no need to be true to the recent Batman trilogy, since there are no more movies set to tie in with that particular Batman continuity (at least as far as I understand). Finally, I think the success of these shows lie in strong characters and strong acting. Gotham varies greatly from AOS in that it is a prequel, and event within do not run concurrently with any movies. This frees up the writers to develop the characters present, but also means we know in the long run no major characters will die. Still, that leaves a lot of room for drama as Detective Gordon tries to clean up the Gotham PD while keeping his friends and loved ones safe. I like the actor portraying Gordon, and that’s why I think the show will prove successful. They just have to keep Gordon incorruptible. 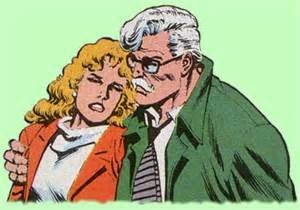 It may seem very unrealistic and cartoony, but that’s the biggest character trait I think of when I think of Jim Gordon. AOS had a great first season. Though I’ve read many opinions that it started slow, I have liked the characters all along. With S.H.I.E.L.D. currently operating underground, and clashing with the US government as well as Hydra, they have a lot of difficulties ahead of them that should lead to a lot of drama! My favorite characters from season 1 were Fitz-Simmons, and they look to be in bad shape, with the best surprise I didn’t see coming in a long time! It looks like it will be agonizing to wait each week for the next episode of AOS. 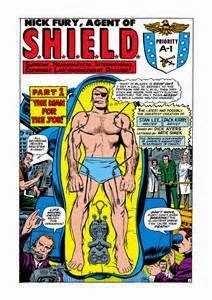 The first ever S.H.I.E.L.D. story by Lee and Kirby! Well, that’s all I have to say about TV for now. I’ll try to come back and comment on how things are going around mid-season! I am making an effort to put a dent in my reading list, and the most recent comic I managed to check off my list is Michael Neno’s The Signifiers #2. Michael introduced the psychedelic world of the Signifiers with a quite interesting and visually interesting premiere issue. He moves things along in issue 2 with some details of the life of Splash, who is pretty much the lead character, and who gains a Ypytlic in order to protect himself from the Voyst. Yep, I typed that correctly! The question is: what is the Voyst and is it good or bad? There are some hints among the prisoners in a castle perhaps and a visit to Splash’s Aunt. It’s an intriguing story and I look forward to reading more! There’s also an episode of Landlark, the Heat-Seeking Dwarf, which involves a trippy and perhaps dangerous tapping into the Voyst. Plus, there’s Thelma, the best dog-woman ever! Really! Go check out Michael’s work on his site and enjoy! Superman made his debut in Action Comics #1, lifting a car over his head on the cover. The scene is not, I’ve been told, repeated in the comic, but remains an iconic image after all these years. I thought I’d do my own take on the idea, and this sketch is the result. I plan to add colors eventually. This week marks the debut of the Out With Dad webcomic being posted on Comic Fury, the site where I post my weekly webcomic, Mutant Elf. I wanted to post the Out With Dad comic on Comic Fury to hopefully attract the attention of some readers who have not seen the webseries. However, I also want to give people who have already read the OWD comic a reason to click over to Comic Fury. Therefore I am beginning the series with a new drawing, which is kind of a “cover” for the comic. Also, I will be writing new comments for each page as I post them. I don’t have an exact timeline for posting pages, except that I plan on a page every couple of days or so. This is also is way to get in the mood for Out With Dad before the debut of the final section of season 3! Seems rather awesomesauce to me! 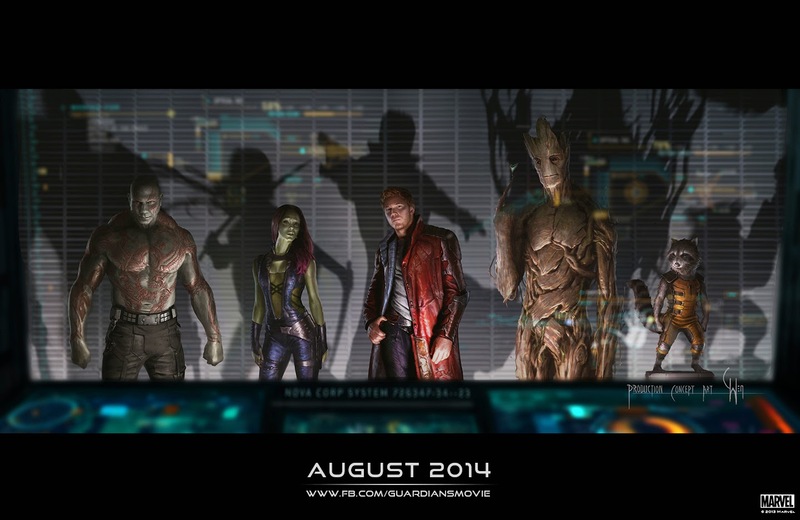 I recently had the pleasure of seeing Marvel’s most recent cinematic release, Guardians of the Galaxy. I must say, this is one excellent movie! It’s a certified hit for Marvel, and there’s a good reason: it’s a wonderfully fun movie! The action, the characters, the effect, and everything else is best described as FUN! Peter Quill/Star Lord is the only human member of the Guardians. He was kidnapped by aliens as a child and grew up in space, becoming a sort of pirate, operating a little outside interstellar law to make a living, yet not being a bloodthirsty hardened criminal. He also has a tape of Earth music he loves to listen to in his spacecraft. Peter lets us human viewers identify with someone quickly and appreciate the challenges he faces and his successes. Movie poster-note the cool shadows! Gamora is the only female member of the Guardians, but she is genetically modified to be far superior to our human lead. She is tough and dedicated, and provides a love interest for our lead. She also has a tragic past she’s trying to overcome. But so do the rest of the gang. She’s interesting, but not as much as the others. Drax is the big, tough guy. This guy is a killer, and not a very smart one. He’s probably the most one-dimensional of the Guardians, but it works wonderfully for him. Rocket is a genetically constructed and cybernetic enhanced raccoon-like creature. He’s got a lot of attitude, and he’s an electronics whiz. From what I’ve read online, he’s a standout favorite among the group. I admit he’s really fun, and much deeper in character than he first appears. I think he shows the most character growth over the course of the movie. Groot is a living tree who only says “I am Groot.” And he’s the most lovable of the characters, as you can easily sense his feelings. Long ago Star Lord was drawn by my favorite comic artist, John Byrne! And there are lots of other characters who are very well written and portrayed. But you’ll have to see the movie yourself to find out about them! Then you can write your own Bloggy or comment about them below! I wanted to say something about the death of Robin Williams, a great actor and comedian whom I have loved for a long time. I’m not sure what I can say about him that hasn’t been said or isn’t known or easy to find out. So I thought I’d share a silly story. When I was in grade school, I wanted to be Mork from Ork. So much so that when I was in one of the school musicals, before taking a bow at the end of the show, I put my hands behind my ears in imitation of Mork’s sign-off Na-Nu, Na-Nu gesture. I had forgotten this until someone reminded me in High School, but the memory came to me today and I felt like writing it here. Thanks for all the great times, Mr. Williams! I’ll miss you. Bill Mantlo is one of the comic book writers who shaped my love for the medium. He has recently gotten some attention as the co-creator of Rocket Raccoon, a character in the Marvel movie Guardians of the Galaxy. Bill wrote many Marvel comics in the ‘70s and 80’s, and I can’t even begin to list them all here. At times, it seemed like he was writing everyone, and I believe he probably wrote comics that included every active Marvel hero at that time. Personally, I own a large part of Mantlo’s long run on the Hulk, as well as much of his Rom. I also have every issue of the Micronauts that Mantlo wrote, some of which took me a while to hunt down! I talked a while ago about my love for the Micronauts (here). Mantlo wrote a Marvel Team-Up story, with Spider-Man, the Hulk, and Woodgod, that was one of the first 3 Marvel comics I ever read. (Got them in a 3-pack.) He also wrote Avengers Annual #9, in which the team fights a foe that comes from their own basement! That Avengers’ annual was absolutely excellent, and was my favorite comic for years. 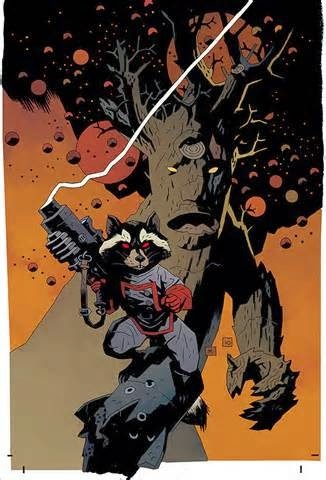 I have to admit that I didn't read the Rocket Raccoon stories that Mantlo wrote, though I remember when the character debuted. I’ll have to rectify that and find them somehow soon. Anyway, I wanted to write my little tribute to Mr. Mantlo and wish him well. I know he’s been residing in a Healthcare facility since a horrible hit-and-run accident left him with permanent disabling injuries. One of the recent stories about him is his reported enjoyment after seeing a special private viewing of Guardians of the Galaxy. I hope it made him as happy as his work made me over the years. I’m working on a drawing of a Viking warrior, or at least the fantasy equivalent of a Viking. 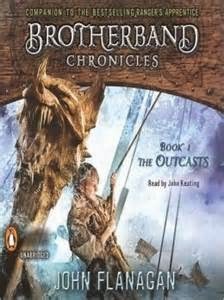 My inspiration for drawing a Viking was my recent reading of the Brotherband Chronicles, a trilogy of young reader novels by John Flanagan that is also a companion set to the popular Ranger’s Apprentice series. I really enjoyed the Ranger’s Apprentice series, but I admit to being hesitant to reading about the Skandians, Flanagan’s equivalent of the Vikings of lore. The Brotherband is a group of young warriors who all have a quality that makes them atypical of the common young Viking. Led by Hal, an amazing inventor who is an outcast because he is only half-Skandian, the group has amazing adventures that are fun to read. I still like the main series better, but this is a nice spin-off and I hope there’s more of the Brotherband in the future. As I said above, I am working on the Viking drawing. It’s still just pencil, and it has a long way to go. But I’m having fun with it, and I’ll post another scan here when it’s done! The Black Widow has grown in popularity, at least among non-comic book readers, due to appearing in three of the recent Marvel movies, portrayed by Scarlet Johansson. It’s strange because there are plenty of other female Marvel heroes that are much more popular than the Widow. The Black Widow from the comics has always been a nice character, though her origin is very tied to the Cold War. She debuted as an Iron Man villain, eventually became a hero, a spy, a member of the now defunct Champions and leader of the Avengers! She has been romantically linked with Hawkeye, Daredevil, and even Bucky. I like her black spy-suit look the best, and I prefer her other gadgets, such as her “widow’s bite” over a gun. Overall, I’d say Natalia Romanov, the Black Widow, is one of Marvel’s best non-powered heroes! One of the things I found most surprising about the first issue of the Avengers when I read it as part of the “Son of Origins” collection was the role of the Hulk. In the preview, Stan Lee speaks of using Loki as a villain that could face a group of heroes. But, in the story itself, Thor takes on Loki by himself while the rest of the team (Iron Man, Ant-Man, and the Wasp) fight…the Hulk! Due to Loki’s trickery, everyone was, in fact, summoned to face the Hulk. In the end, everyone is friends and the big green guy joins the group. But just to show how little Bruce Banner’s alter ego fit in the team concept, he left at the end of issue two. In issue four, he was replaced by Captain America, who tried to convince the Jade Giant to rejoin later in the teens or thereabouts. Therefore, despite being a founding member, the hulk has never hung around with the Avengers for long. Which is why I drew this picture. I think it shows the relationship between heroes such as Iron Man and the purple-pants wearing behemoth. You can’t be sure if Hulk will help you or smash you. I guess you take the chance, because you definitely don’t want him fighting for the other side. I realize I haven’t posted anything on my blog here lately, so to make up for it today I thought I’d post some recent art I’ve been working on and comment on the characters or something. Maybe one new pic every day or two. First up we have Captain America and his first sidekick, Bucky. Bucky is a strange character to me. Cap was created in a time when most adult heroes had teen sidekicks, and Joe Simon and Jack Kirby followed suit with Captain America, giving him a young protégé called Bucky. Bucky was really Bucky Barnes, the company (Cap was in the army) mascot, who had inadvertently discovered Steve Rogers was really Captain America, and that led to him being trained to be Cap’s junior partner. The funny thing is, while Cap had the Super Soldier Serum and an indestructible shield, Bucky just had a cool costume and a domino mask. He really didn’t do much more than get captured, as shown on most of the early covers of Captain America Comics. When Stan Lee brought Cap into the ’60 via suspended animation to join with the newly created Avengers, he revealed that Bucky had died during he and Cap’s last mission. I think removing Bucky from the team was a good move, as him being alive didn’t add anything to Cap, but his death haunted Steve Rogers for years. Bucky was mostly unknown when people like me started reading Avengers and Captain America comics in the ‘70s and ‘80s, and Captain America was one of Marvel’s greatest. 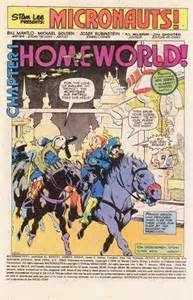 Still, I loved the rendition of Bucky and the old heroes in Roy Thomas’ Invaders comics in the’70s. Later, Bucky would return in a storyline that fans seemed to enjoy, but I still haven’t read. 1989 was a very interesting year for me. I spent most of the year in Long Beach, California working for the United States Navy. I was discharged in August and then started my first year of college. 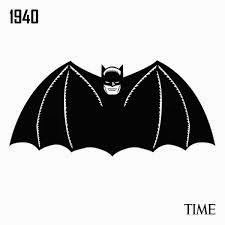 But the amazing thing about that year was the way Batmania has swept the nation. It was amazing. There were Batman things everywhere. Shirts, hats, shoes, posters, toys, games, you name it. In fact, my Navy buddies (Hi Carl, Tony, Rick and Mike!) and I made a game out of it. We noticed so many people wearing batman paraphernalia when we were at amusement parks in California that we decided to count how many people there were showing their Bat-fandom. I forget our exact count now, but let’s just say it was more than I’ve ever seen of a group of unrelated people wearing the same theme clothing outside of military uniforms! The Batmania was in anticipation of the upcoming Batman movie, and continued well after the movie premiered. It brought a lot of nice attention to comics about Batman and other characters, and I think had a lot to do with the increase in comic sales later in the 1990s. It was nice to finally get some media attention for comic writers and artists as real writers and artists, not silly creators of kids’ stuff. In fact, I remember having a conversation outside of the movie theater with a guy who worked for the Entertainment Tonight TV show about the changing demographics of comic book readers. 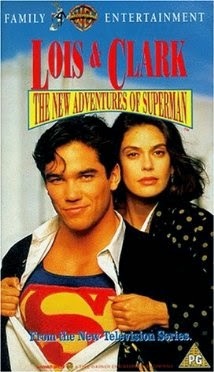 By the way: the actual Batman movie? Yuck! I was so terribly disappointed. It’s hard to give a full review, since I’ve tried very hard to forget about it in the intervening years, but I can give some lowlights: They wrecked the Batman costume, which started a trend of movies ignoring what comic book costumes look like originally. Michael Keaton was a horrible pick as Batman, and looked like a total fool as Bruce Wayne. The actions scenes were weak, and Batman never showed any ability to actually fight. Finally, the movie can’t decide if it’s a period piece, taking place in the 40’s era as half the costumes/vehicles appear, or a modern story. There are several sequels to this movie that are all worse than the original. It would be soon after seeing Batman that I figured out I don’t like any movies director Tim Burton ever does. Eventually, Batman would return to cinema in the excellent Batman Begins and its two sequels (I like the third installment best). Those are good movies to see. I highly recommend those! 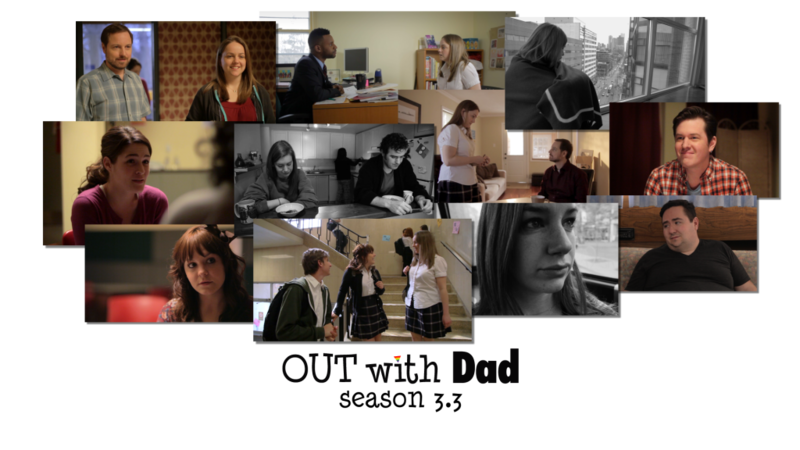 Reviews: "Double date with Dad" and "Pushed Out"
I now continue my analysis of the second part of season 3 of the award-winning webseries “Out With Dad”. “Double Date with Dad” picks up where we left off, as Claire drags Rose to talk to Rose’s dad while he is on his date with Angela. This inevitable first meeting between the daughter and Dad’s girlfriend is light and entertaining and every bit as good as I hoped it would be! To start with, we have Angela and Claire encouraging the group to sit all together, while Dad and Daughter are reluctant to do so. It fits the personalities perfectly, as we know Claire isn’t afraid of much, or going to consider the consequences of something until after she has committed to the idea. Angela, as we saw in the first part of season 3, is anxious to meet Rose and a bit miffed that Nathan didn’t tell Rose about his dating. We don’t get to find out if Nathan mentioned that Rose knew about Angela before now, but I think it’s likely. So, the group gets together for desert, and…awkward silence…finally broken by a conversation about Nathan’s shirt design. Then the conversation gets to interesting things, such as the pairings telling of how they met, and Rose admitting she didn’t even know Claire’s name. (And, of course, neither did us fans!) The incident with the tea is funny and another of those Miller-ism character moments. One of the many little touches that make the characters seem so real. I would be certain to follow the Miller tea rules, if I liked tea. Rose gets a glimpse of something (Vanessa, which I’ll talk about later) and Angela gets a call, which leaves Nathan to express his feelings about Rose dating Claire. Is there a little bit “I’m glad it’s you, and not that other girl who makes Rose upset all the time” in Nathan’s appreciation? As a parent, I would probably see Claire as the best match for Rose. Parents want happy children, not upset, crying children. Finally, we have Claire being a total potty-mouth, and father and daughter discussing how much they both like Angela. Which is good, because I like her a lot, too! And speaking of crying children, we come to “Pushed Out”, the finale of the 3rd season’s second block. That sounds confusing, so maybe I should just refer to it as the mid-season finale, as Jason does. Anyway, I need to get more serious, because this episode is quite serious. First, you have the issue with the school dance and buying a “couple’s ticket” for a same-gender couple. I never went to dances, and I never heard of “couple’s tickets” before watching this show, but it does stand to reason that a couple is a couple, no matter what the sexual orientation. However, as Kenny notes, it isn’t entirely surprising. They are in a catholic school, and it just happens that bigotry in the name of god is something a lot of people support. I’m not an expert on religions, but I understand the bible calls for the extermination of homosexuals, though many Christians don’t agree with this policy. I know laws are changing rapidly in the United States, and they are even more LGBT friendly in Canada, but changing a religion is something I think will take longer. Anyway, Claire accidently starts something, Rose gets upset (probably heightened by her despair over Vanessa’s disappearance), Kenny awkwardly tries to comfort Claire, and then Rose gets assaulted by a homophobe. While people stand and watch. Which is something we should think about. Because if you are supporting an organization that practices bigotry as an official policy, and I mean any type of bigotry against anyone or any group, you are standing there watching too. You may not be watching someone get physically beaten, but you are aiding in the trampling of their rights as a human being. The human race has come a long way, and we are only going to get better if we refuse to put up with the bigots and their excuses. When I was just a wee little lad, my favorite TV show was Emergency! The tale of paramedics and the amazing job they had rescuing people. 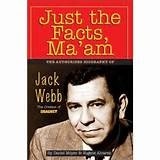 I recently finished reading “Just the facts, Ma’am: The Authorized Biography of Jack Webb”, and my favorite chapter was the one on the creation of Emergency! But I want to talk more about Jack Webb and his life and legacy here, not about Emergency! So I’ll get to it. First, a disclaimer: the primary author of “Just the Facts” is my friend Dan Moyer, so I am a bit biased I guess, but I’m going to be as honest as possible. “Just the Facts” is a fascinating look into the life of someone who was one of the early pioneers of television drama. Jack Webb started in radio and then transferred his talent, and his shows, into Television, while also acting and producing a few movies along the way. The sheer bulk of his work is amazing, and most of it is very darn good, too! I found it quite interesting how many shows Jack created that never made it past the pilot, or had very short runs on TV. The key to his success was working very hard at what you believe in and eventually getting a break or two. Jack’s life shows why he was such a hard worker. Her grew up poor and never knew his father, and I think that’s the main reason he did so much once he found a way to make a living. He didn’t ever want himself or his family to be poor like he was. His work habit resulted in many successes, but they also cost him in his personal life. Jack had many marriages and was not a steady presence in the lives of his children. I also think his lifestyle aided his demise. He worked hard and also made sure he never lacked in food, drink, and tobacco. Though no one area probably seemed extreme to him, the combination meant he was not to live to an old age. But he has a huge legacy that lives on to this day, mostly through the success he built out of his trademark series, Dragnet! Dragnet began as a radio series and then had two successful runs on television with Jack at the helm. The idea behind the series was to depict police officers realistically, instead of following the extremes of the day which had them as violent vigilantes or comedic buffoons. Dragnet began the genre of the “ripped from the headlines” realistic cop show that has been succeeded by shows such as Law & Order and CSI. Parodies, many poking fun at Jack’s character Joe Friday, due to his strange last name, copy cats, reboots, and a movie have followed, but none have been successful as the series that Jack made. Jack was even working on a third Dragnet TV series when he unexpectedly died. Dan and his collaborators do a much better job telling it that I have, though Dan has told me he wishes more anecdotes had made it past editing. You can get more info from Dan himself if you pick up Dragnet on DVD, and Dan produced and directed the DVD extras on season 2! In conclusion, let me recommend anyone interested in the early days of television, cop shows, or pop culture to buy this book and give it a read! It’s full of great information! Also you can check out lots of Jack Webb pictures and other vintage stuff at the Facebook group, Jack Webb Archives! 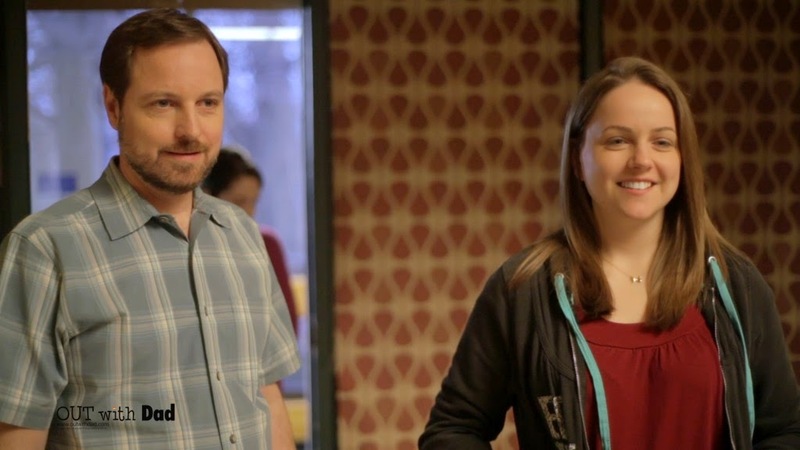 Reviews: "Catching up with Dad" and "Going Out"
I am finally getting around to writing my thoughts about the second block of episodes of the third season of Out With Dad. I have been thinking a lot about these episodes, as I always think a lot about Out With Dad because the series, in general, makes me think. It’s just that type of show. I also thought about how to post my little reviews of these episodes, and I decided I would try to review the Rose episodes first, and save Vanessa’s story for later. Rose’s story continues with episode 3.08, “Catching up with Dad”. Rose and Nathan play catch while talking. The first thing they talk about is not talking about Rose being gay. While I can sympathize with Rose, discussions about other things aren’t going to advance the story, so they do end up talking about Rose and Claire and that they’ve been outed as a couple. Rose is able to claim that is isn’t a big deal, so they talk about Angela. Okay, this is a moment I’ve been waiting for! And the moment does not disappoint. The discussion about Nathan and dating in the past answers some questions and, because he admits things are becoming serious, advances the story. By the way, the setting at the park and having Nathan and rose playing catch works great, making for some cute moments during their conversation. I also noticed Rose had her hair in a ponytail. Until I drew the comic adaptation, I never noticed that she sometimes has her up. It might be easier to draw than her normal hairdo. Finally they reach home and encounter Mr. Lemay, who tells them about Vanessa being missing. I’ll discuss the LeMays when I write about Vanessa’s story. Rose and Nathan’s reactions are understandable and expected. “Going Out” begins with a serious conversation between Rose and Kenny about Vanessa’s disappearance. It’s interesting to see Kenny serious in this scene and his question to Rose: “Do you love her?” was very profound. That is, if Kenny meant it to be vague. If he didn’t, who was Kenny talking about: Claire or Vanessa? I would think Vanessa, because Kenny is her friend and knows her well, though he shouldn’t forget how Rose and Claire connected at the museum. Kenny does show that his true strength as a good friend is his caring, not his goofiness. The scene shifts to a conversation with an upset Rose and Nathan about not knowing Vanessa’s fate and the need to go on and worry less about things they cannot change. This scene transitions between the more serious beginning and the lighter scenes that follow. And it’s a great display of character interaction and acting. Nathan’s difficulty asking Angela out lets us all laugh at Out With Dad again. One of the great aspects of this show is the ability to tackle serious situations without getting too serious all the time. Jason lets us all breathe a little and have some fun. In my case Nathan’s predicament reminds me of times I've gone through the same sort of thing. Except I never tried to ask anyone out via e-mail. Because I’m old. The scene with Nathan getting ready is another situation that reinforces that this show is really about the relationship between a Father and Daughter more than anything else. The repeat of the “really nice” line works great, and Nathan’s reaction to Rose telling him not to stay out too late because it’s a “school night” is priceless! The final scene with Rose and Claire has some good information about Claire’s family life. It seems her family will not go the direction of the LeMays, and Claire is very “bubbly Claire” about this development. She’s also very “Claire” putting on the shirt in the middle of the street, and her talking-not-thinking statement about her love for Rose. Rose sees her dad, on his date, and KISSING Angela!!! !